The winners from the 2016 Duck & Wine Festival are awarded a grant to present to a nonprofit of their choice. 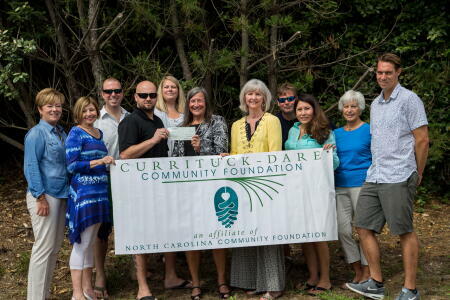 Below are photos of the Currituck-Dare Community Foundation (CDCF) board of advisors presenting grant checks with the winning chefs and nonprofits. 1st place people’s choice winner, Stripers Bar & Grille (above), presenting a $500 grant to the Just Enough Fund. 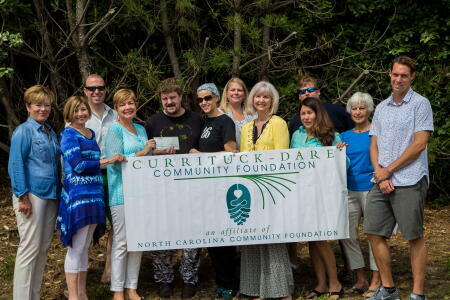 Pictured are (left to right) Patty Guillaume, Loismary Hoehne, CDCF Board Member Dan LaRue, Stripers Bar & Grille General Manager and Chef Alfredo Landazuri, NCCF Regional Director Natalie Jenkins Peel, Just Enough Fund President Rita Ayers, Kathy Romm, Scott Foster, Nina Foster, CDCF Board Member Lynne Alterman and Duck & Wine Planning Committee Member Matt Price. 1st place best dish winner, Salt Box Café (above), presenting a $500 grant to Food For Thought. Pictured are (left to right) Guillaume, Hoehne, LaRue, Food For Thought President Linda White, Salt Box Café Owners and Chefs Randolph and Amanda Sprinkle, Peel, Room, Scott Foster, Nina Foster, Alterman and Price. Duck & Wine Festival Co-Chair Lynne Alterman, presenting (above) $1700 to Food for Thought President Linda White in appreciation of their participation in the Duck & Wine Festival. 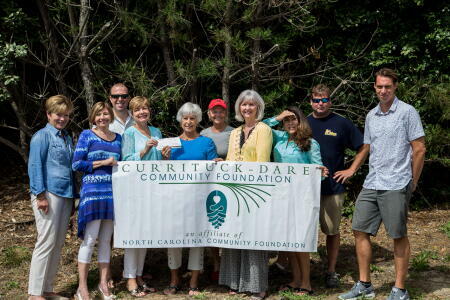 Pictured are (left to right) Guillaume, Hoehne, LaRue, White, Alterman, CDCF Board President Janet Colegrove, Romm, Nina Foster, Scott Foster and Price. Pictured (above) are some of the winning Duck & Wine Festival chefs receiving their prize checks. 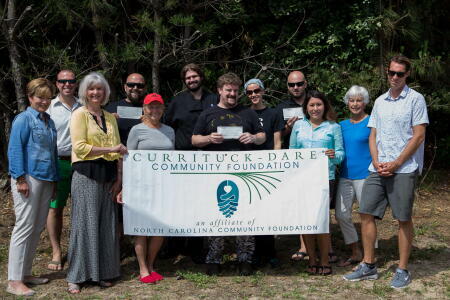 Left to right are: Guillaume, LaRue, Romm, Matt Broughton of Corolla Cosmos Pizza, Colegrove, Cory Bryant of Aqua, Randolph & Amanda Sprinkle of Salt Box Cafe, Alfredo Landazuri of Stripers Bar & Grille, Foster, Alterman and Price.